LONDON - The Liberal Democrats has today launched an outdoor and digital campaign attacking both the Labour and Conservative parties over the way they have led the country in recent years. Created by Iris, the campaign is part of an effort to challenge the voters wavering between Labour and Conservatives to consider a third option when voting in the forthcoming General Election. The campaign sees the creation of a mock political party the "Labservatives", which merges the values and ideals of the main two parties. 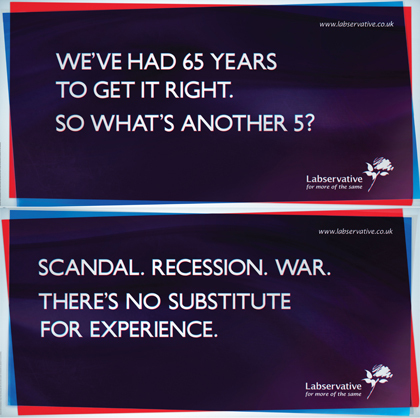 The Labservatives use the slogan "For more of the same", and has a logo of a scribbled tree sitting on top of a rose stem. 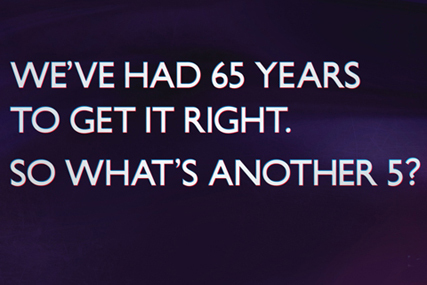 The outdoor ads feature a number of different headlines placed on a purple background, which merges Labour's red and Conservative's blue. Headlines include: "Scandal. Recession. War. There's no substitute for experience," "You might not trust us but at least you know us," and "We've had 65 years to get it right. So what's another five?" The campaign will also include a spoof website www.labservative.com and a viral which features a hybrid of David Cameron and Gordon Brown delivering the party's manifesto. A link on the site, under the heading "know the enemy", redirects users to the Liberal Democrats' official party site. Jonny Oates, director of general election communications for the Liberal Democrats, said: "Our campaign may appear to be tongue-in-cheek but in fact it raises a very serious issue. "The recent history of government in this country is of Labour and the Conservatives passing control back and forth between each other. The party changes but history repeats itself. "We want the British public to know that the Liberal Democrats are the only real alternative." Earlier this year, the Liberal Democrats appointed The Assembly to handle the majority of its advertising work. The agency's relationship with the party is unaffected by Iris' appointment. Join the debate on Brand Republic's Red, yellow and blue general election blog.